High prices are a significant reason that healthcare spending in the United States exceeds that in other developed countries.1 In part, this reflects the American system’s reliance on private markets to manage healthcare spending. Concern over high prices has motivated research that attempts to quantify cross-payer price differences. An extensive literature finds that prices paid for both hospital2-4 and physician2,3,5 services in the commercial group market are consistently higher than those paid by traditional Medicare (TM). Much less research has compared prices paid by Medicare Advantage (MA) plans with those paid by TM. However, emerging evidence suggests that prices for hospital6-10 and physician11 services paid by MA plans are similar to TM prices (and thus well below the prices paid by the same plans for their commercial business). In this study, we update and extend the work of Trish et al,11 who compare the fees paid for physician services by 1 MA insurer with TM rates for 2007-2012. Specifically, our data cover multiple insurers and span 2014-2015. Expanding the set of insurers studied increases confidence in the generalizability of the results. More recent data are important because key policy changes since 2012 may have affected both MA and TM prices. In MA, changes under the Affordable Care Act (ACA) to benchmark calculation and ending of a 2012-2014 demonstration for quality bonus payments reduced the benchmarks that many plans faced. In TM, the 2013 cuts to provider payment under sequestration, coupled with the sustainable growth rate formula’s constraint on payment updates, contributed to low annual increases in physician fees. Thus, in light of these recent policies, we re-examine the relationship between MA and TM prices. Lastly, we extend the literature by investigating whether the relative prices paid by MA plans differ based on the generosity of plan payment. Our primary data source is the 2014-2015 Truven MarketScan Medicare Claims Database, which captures utilization and spending for retirees who are enrolled in either group-based MA plans or employer-sponsored supplemental plans to TM. MarketScan includes claims from numerous large employers and insurers across the United States. We restrict the data to patients who are continuously enrolled for at least the full calendar year and reside in metropolitan statistical areas (MSAs). We observe medical claims for 134,941 MA and 152,783 TM beneficiary-years. To classify plans in MarketScan, we utilize information on plan type and the fraction of enrollee spending that is covered by third-party payers (the coordination of benefits [COB] fraction). For Medicare supplemental plans (which pay the TM price), TM pays most of the claims’ costs and is a third party, so the COB fraction is high. For MA plans, the private plans themselves are the primary payer, so the COB fraction is low. We examine the distributions of COB fractions for different plan types and identify clear cutoffs for the fraction; the distributions are available in the eAppendix (available at ajmc.com). Medicare supplemental plans are defined as those with a “comprehensive” plan type and COB fraction of 0.7 or greater. MA plans are defined as those with a plan type consistent with MA managed care (eg, health maintenance organization, preferred provider organization) and COB fraction of 0.4 or less. We exclude private fee-for-service (FFS) plans. We also exclude plans with any capitated claims, because we cannot observe prices for individual services paid under capitation, and prices for these plans’ noncapitated claims may be affected by unobservable plan features. We focus on low-complexity office visits with an established patient (Current Procedural Terminology [CPT] code 99213), the most frequently billed procedure in our data, and electrocardiograms (CPT code 93000), the most frequently billed diagnostic test in our data. Our measure of price is the total payment made to the physician for a service, including both insurer payments and patient cost sharing. We restrict our analysis to claims that are paid in network, have the office as the reported place of service, and are for professional services. We drop claims with 0 or negative price (less than 1% of claims for each service that we analyze). To increase sample size, we pool the data across 2014 and 2015. We use the MSA, which is the smallest geographic unit that we can observe in MarketScan, as our definition of a market. For a given service, we estimate the TM price using the median price across all Medicare supplemental claims for the service in an MSA. Similarly, our estimated MA price is the median price across all MA claims for the service in an MSA. We divide the MA price by the TM price to obtain an MA-to-TM price ratio for each MSA. Lastly, we calculate the median of the MSA-level price ratios. Results are similar if we take the mean instead. As a robustness check, we calculate an MA-to-TM price ratio for each unique combination of an MA plan and the MSA in which it operates; we obtain similar results. In subanalyses, we divide the MSAs into 4 groups based on the generosity of MA benchmarks, as measured by the ratio of the benchmark to local FFS spending. Under the ACA, county benchmarks are set at 95%, 100%, 107.5%, or 115% of per capita FFS spending in the county. Counties in the highest quartile of FFS spending receive 95% of FFS, whereas counties in the lowest spending quartile receive 115% of FFS. We aggregate county benchmarks to the MSA level by taking an equally weighted average of the constituent counties’ benchmarks. We then place MSAs into 4 groups based on their benchmark ratios and report the median MA-to-TM price ratio for each group. Because of variation across counties in an MSA and transition to ACA-outlined benchmarks, the actual MSA benchmarks are not precisely 95%, 100%, 107.5%, or 115% of FFS, but the mean benchmarks of our 4 groups are very close (by construction). The Table presents our primary results. For low-complexity office visits with an established patient, the estimated median price ratio is 1.01. We repeat the analysis on office visits of varying complexity with both new and established patients and find that the median price ratios are all close to 1.00. The estimated median price ratio for electrocardiograms is 1.00. We then disaggregate our result for CPT 99213 office visits by MA benchmark generosity (ie, benchmark relative to FFS). From the lowest to the highest benchmark group, our estimated median price ratios are 1.01, 1.01, 1.02, and 1.02, respectively. We do not present the analysis for electrocardiograms because of small sample size and inadequate variation within groups. Our results add to a growing body of evidence that MA prices for both physician and hospital services are often close to TM rates and suggest that this finding has been relatively stable, despite recent policies that may have affected MA and TM prices. They also imply that private plans pay much less to providers for their Medicare business than for their commercial business. For the most common office visit (CPT code 99213), our estimated price ratio of 1.01 is similar to, although slightly higher than, the 0.969 ratio reported by Trish et al. Thus, the main conclusion—that MA physician prices are similar to TM rates and well below prices paid by health plans in the commercial market—holds over time and across more insurers. Our somewhat higher ratio could reflect our use of MarketScan and averaging over a broader sample of geographic markets and MA insurers and plans (Trish et al use data from just 1 large insurer). Roberts et al12 note variation in what plans pay for the same service and in what providers get paid by the same insurer. Our higher ratio could also reflect our newer data (2014-2015 vs 2007-2012 in Trish et al). TM prices have increased slowly, so it may be the case that over time, MA plans have experienced faster fee increases and thus pay relatively more. We cannot distinguish between these explanations with our data. Interestingly, we find that generosity of plan payment does not appear to affect how much employer-sponsored MA plans pay physicians relative to TM. The median MA-to-TM price ratio for a midlevel office visit remains close to 1.00, even as benchmarks increase. Our analysis cannot establish causality, nor does it account for benchmark caps or payment bonuses tied to plan quality ratings. 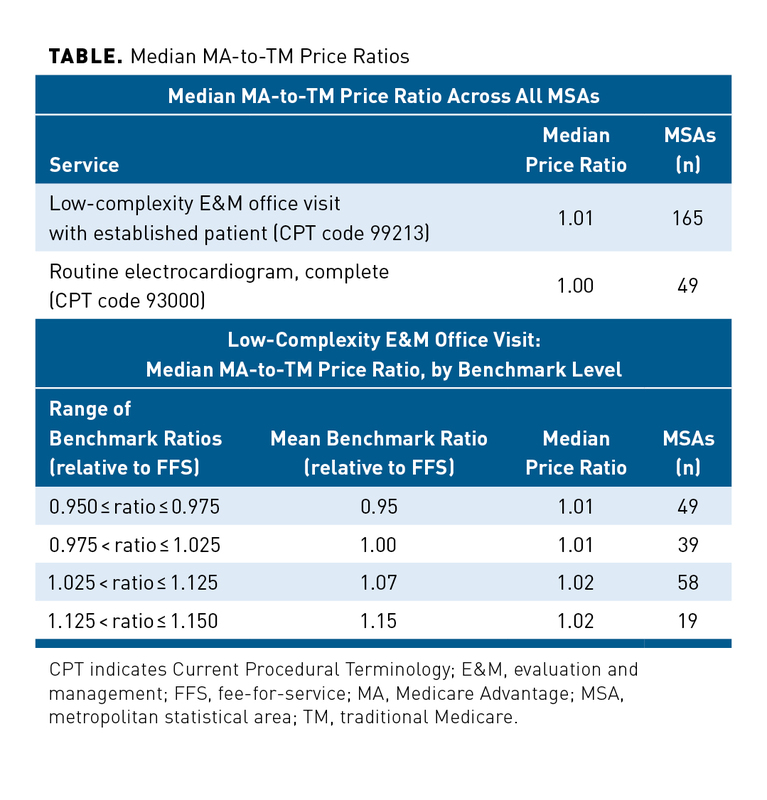 Nonetheless, our data suggest that, at least for this common physician service, similarity between MA and TM prices holds despite changing the generosity of MA benchmarks. As discussed in prior work,7,11 the similarity of MA to TM prices may reflect 2 aspects of the MA program that allow private plans to secure lower prices than they pay in the commercial market. First, providers negotiating with MA plans realize that if MA premiums are high, enrollees may opt out of the private plans, and providers would then receive the TM price. Second, and maybe more importantly, if providers do not come to agreement with an MA plan, they would (by statute) receive at most the TM price for any out-of-network care delivered to the plan’s patients. These 2 features provide some constraint on provider bargaining power and thus on MA prices, highlighting the important role that TM plays even in the MA market. Our results have 3 implications. First, they bolster the argument that the existence of the TM program helps private plans succeed in Medicare. Second, they imply that Medicare policy changes that affect TM reimbursement can in turn affect MA prices (and therefore spending). This is salient because MA enrollment, which is now at 19 million beneficiaries,13 continues to rise. Finally, similarity in prices emphasizes the importance of correctly setting TM prices and addressing perceived over- or underpayments. Policy makers should be cognizant of these points as they consider future changes to Medicare. For example, as Trish et al argue, proposals that reduce the role of TM in a premium support system could have major consequences for the prices that private plans pay. Our study has several limitations. First, we observe prices only for plans that cover a specific segment of Medicare beneficiaries: retirees enrolled in employer-sponsored plans. However, there is no particular reason to believe that these plans price differently than plans in the individual MA market. In fact, our results are consistent with prior work that utilized data likely containing claims from MA plans sold in the individual market. Second, our method for classifying plans may be imperfect. However, our approach is conservative and excludes any plans that are potentially inconsistent with Medicare supplement or MA. Third, MarketScan’s sample of Medicare beneficiaries is fairly small and has poor coverage of certain regions. We are unable to study other office-based services because prices are observed in too few markets. Fourth, because the geographic distribution of MarketScan enrollees differs from the actual geographic distribution of Medicare enrollees, our results are not nationally representative. Lastly, we are unable to observe payments that flow from plans to providers outside of claims data (eg, withholds). Outside payments may cause some MA plans to report abnormally low prices, and we exclude these plans from our analysis. Similarly, some plans appear to pay strangely high prices, and this motivates our decision to use medians rather than means. After analyzing 2014-2015 claims for common physician services, we find that employer-sponsored MA plans pay prices that are similar to TM rates. Our findings are consistent with those of earlier work and suggest that similarity between MA and TM prices has been stable over time, despite background policy changes. We also find that for routine office visits, group MA plans pay near-TM rates, regardless of MA benchmark generosity. Similarity in prices emphasizes the important role that TM plays in the MA market and that TM payment changes could have a spillover effect on MA prices and spending. Policy makers should keep this in mind as they debate Medicare reform proposals. Also, as we enter a new era of physician payment under the Medicare Access and CHIP Reauthorization Act, it will be important to continue monitoring the relationship between MA and TM prices. The authors wish to thank members of the Harvard Medical School P01 team for helpful discussion and feedback.